Spirit AeroSystems designs and builds aerostructures for both commercial and defense customers. 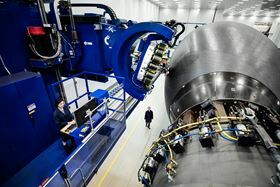 Spirit AeroSystems is to join NASA’s Advanced Composites Consortium (ACC) as a Tier-1 member. The ACC is a public-private partnership focused on progressing knowledge about composite materials and improving the performance of future aircraft. The consortium is managed by the National Institute of Aerospace. ‘We’re excited to collaborate with other industry leaders to work on new ideas and share information that will benefit the aerospace industry as a whole,’ said Spirit senior vice president & chief technology officer John Pilla. The ACC was established in 2015 in support of the Advanced Composites Project, part of the Advanced Air Vehicles Program of NASA’s Aeronautics Research Mission Directorate. The project’s aim is to reduce product development and certification timelines by 30% for composites used in aerospace applications. Member organizations in the consortium participate in research focused on three areas: prediction of life and strength of composite structures, rapid inspection of composites and manufacturing process and simulation. This story is reprinted from material from Spirit, with editorial changes made by Materials Today. The views expressed in this article do not necessarily represent those of Elsevier. Frédérique Mutel, the present of JEC Group, has been promoted to the rank of officer in the Order of the Legion of Honour by the French president.